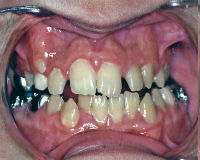 Losing your teeth, no matter what the reason, can be a traumatic experience. Dentures can be created to very closely resemble the appearance of natural teeth and with little change in your appearance. 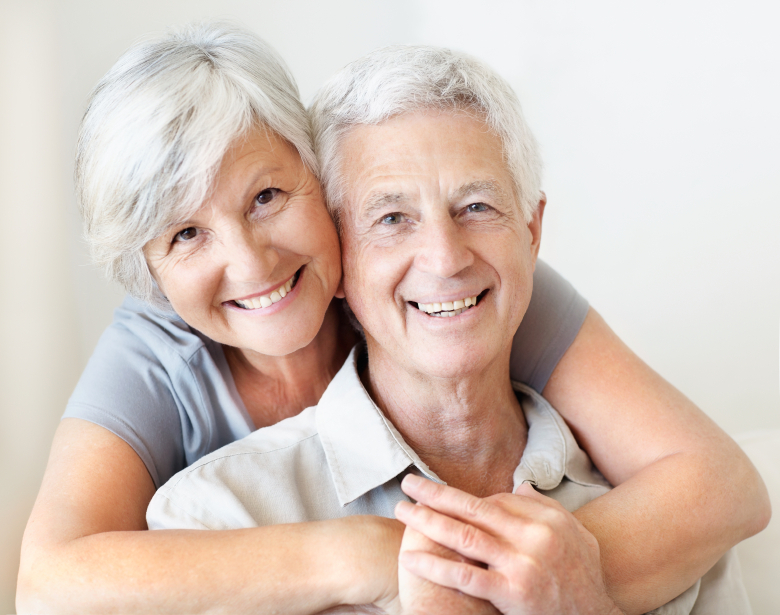 Whatever you need, there are various types of dentures; whether it is meant to replace one tooth or a full mouth, a customized treatment plan will be devised for you. This is created and placed in your mouth after all of the remaining natural teeth, either upper jaw, lower jaw, or both, have been removed, and the gum tissue has healed. Several months may be required to ensure complete healing. This denture is placed in your mouth immediately after the remaining natural teeth have been extracted - at the same visit. An appointment with the dentist, and possibly an oral surgeon, are used to create the final denture and prepare you for the visit. 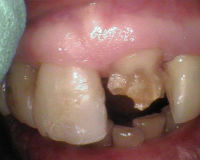 You do not have to be without teeth during the healing period. 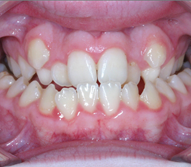 Immediate full dentures usually require reline procedures to readapt the lining of the denture to the final contours of the healed tissue. 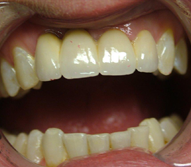 If you have a few healthy natural teeth, the teeth may be modified so that their roots may be used to support the base of a complete full denture. Root canal therapy is performed on the teeth that will be used for support, then the height of each tooth is reduced to the level of the gum line. 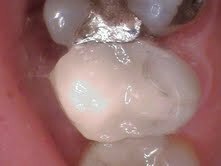 This way the roots, bone and gum tissue, which hold the roots in place, can give additional support for the full denture. 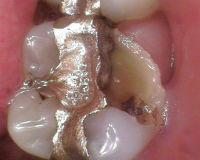 This is very important for lower full dentures, which can be difficult to maintain in place with any stability. A complete denture can be made to fit over dental implants, which can serve as artificial roots in the manner of an overdenture. 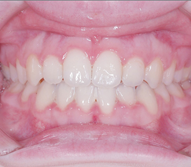 In some cases, retentive attachments are placed on each implant and within the denture base. 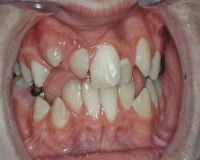 The denture can then be snapped in and out. 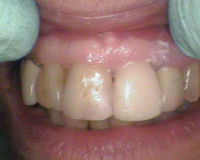 In other cases, a bar is created to fit over the posts attached to the implants. In this situation, the retentive attachments are part of the bar and the denture base, and the full denture snaps on to the bar. 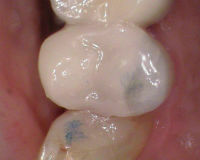 Well-placed implants with healthy gum tissue can help reduce jaw and gum tissue shrinkage. 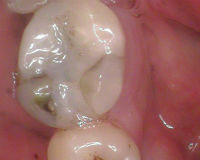 As the years pass, the tissue and bone may shrink and the dentures will loosen. Also, if one loses weight you may notice that the denture may loosen. 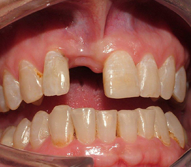 Dentures can be relined if necessary. 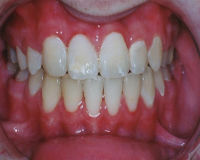 A relined denture will fit like a brand new denture. A full denture wearer should visit the dentist on a regular basis to get an evaluation of the palate, tongue and surrounding tissue. 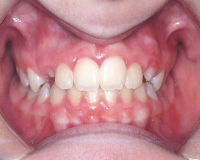 Sore spots should not be ignored - see the dentist for adjustments as needed. 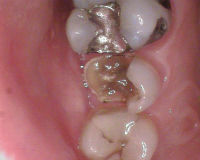 Dentures should be cleaned, if possible, after each meal to keep them free of plaque and tartar. This prevents permanent staining and bad breath. 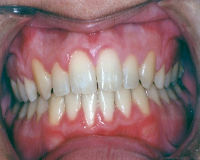 If one is able, brushing the denture is advised, as well as rinsing the mouth to clean it of any debris. 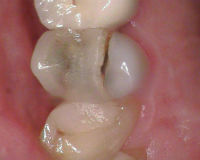 If some natural teeth remain, brushing them is advised. It is also suggested that dentures are soaked at night after brushing them to remove food debris, plaque and germs that brushing can leave behind. Over-the-counter cleaning agents are available. 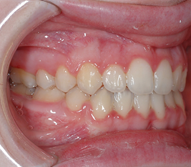 It is healthy to keep the teeth out overnight to avoid excessive pressure on the soft tissue and bone. 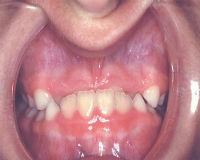 Whenever your denture is out of your mouth, it should be stored in water or denture solution. You can also use mild soap, hand or dishwashing liquid, denture cleanser or denture toothpaste which is non-abrasive, It’s ingredients also kills germs and bacteria which can cause denture odour. 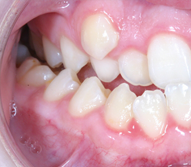 Generally dentures are not as strong as natural teeth.